Fleeing an unhappy past in England, penniless Lucy Snowe starts life anew at a boarding school in cosmopolitan Villette, a stand-in for Brussels. 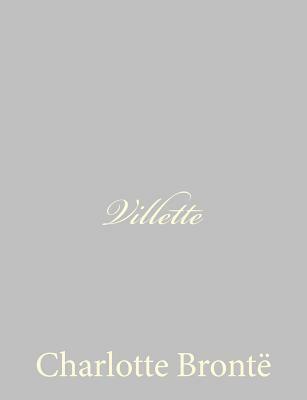 The mystery, jealousy, and love that she finds there give Charlotte Bronte's final novel much of the Gothic tone and psychological incisiveness that prompted George Eliot, Virginia Woolf, and others to call "Villette" her finest work. Based on Bronte's own experiences in Brussels and her attachment to a brilliant teacher with a strong and eccentric personality, this superb romantic novel is an exceptional example of how a great writer transforms the ordinary events of her life into vivid and exciting art. "Villette" represents the inimitable Bronte genius by giving us a masterful portrait of Lucy Snowe, who belongs beside the great nineteenth-century literary heroines--and who will strongly appeal to modern readers. With a New Introduction by Adriana Trigiani and an Afterword by Helen Benedict. Charlotte Bronte (1816-55) was the third of the three famous Bronte sisters. Along with their brother, they grew up in the isolated Yorkshire village of Haworth with no real schooling and little care. The Bronte sisters tried for ten years to make their living as governesses. Finding the occupation hateful, they decided to set up their own school. To prepare themselves, Charlotte and Emily set off for Brussels to learn French and German. Back in Haworth, Charlotte and her sisters published a volume of poems; though only two copies were sold, the Brontes were stimulated to attempt novels. Emily's "Wuthering"" Heights" and Anne's "Agnes Grey" found publishers, but Charlotte's offering was returned with the suggestion she try again. The manuscript of her next novel, "Jane Eyre," was accepted overnight and became an immediate success. "Shirley," "Villette," and "The Professor" complete the tally of her novels. Adriana Trigiani is an award-winning playwright, television writer, and documentary filmmaker. Her books include the "New York Times "bestseller "The Shoemaker's Wife; "the Big Stone Gap series; "Very Valentine; Brava, Valentine; Lucia, Lucia; "and the best-selling memoir "Don't Sing at the Table," as well as the young adult novels "Viola in Reel Life "and "Viola in the Spotlight." She has written the screenplay for "Big Stone Gap"," " which she will also direct. She lives in New York City with her husband and daughter. Helen Benedict is the author of such novels as "Sand Queen," "A World Like This," "Bad Angel," and "The Sailor's Wife." She is a professor at Columbia University, where she teaches writing and literature in the Graduate School of Journalism.